The death occurred at the Maplewood Manor, Alberton, on Saturday, September 8, 2018, of Beverley Jean Rayner, beloved wife of Archie S. Rayner of Alberton, age 78 years. 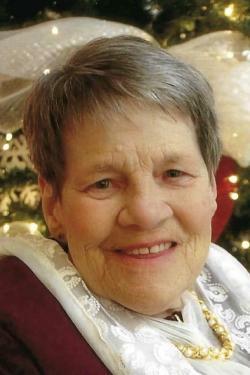 Born at Kirkland Lake, Ont., on December 14, 1939, she was the daughter of the late Henry and Ada (nee Post) Ortwein. Loving mother to daughters, Janice (Kevin) Hancock of Waterdown, Ontario, and the late Wendy (deceased 2014) Danny Gallant of Elmsdale. Cherished grandmother to Vanessa (Kendall) Schurman, Chris (Meagan), Bradley, Emmalee and Katie Gallant, Melissa, Kaleigh and Devin Hancock. Great-grandmother to Noah, Lily and Rosie Schurman. Dear twin sister to Patricia (late John) Bertoia of Ontario, and sister-in-law to Marjorie Ortwein, Lois Carew, Willard Rayner, Pansy Webster, Norma (Wyman) Cairns, Everett (Bernie) Rayner, Sandra (Jim) Davis, Tommy (Debbie) Rayner, Glen (Maureen) Rayner, Bea (David) Roberts and Erma McInnis. Lovingly remembered by Miriam Gallant and Velma Bince. She will be sadly missed by her many nieces, nephews, cousins and friends. She was predeceased by siblings, Helen (Hilly) Greer, Francis (Roy) Barnett, Emerald, Billy (Mary), Joyce, Jimmy, Ronald (Maydell), her mother and father-in-law, George and Helen Rayner, step mother-in-law, Lillian Rayner, and by brother and sister-in-laws, John Bertoia, John Carew, Faye Rayner, Albert Webster and David McInnis. Resting at the Rooney Funeral Home and Chapel, Alberton. Visiting hours Wednesday, 6:00 to 9:00 p.m. Funeral Thursday afternoon from the Alberton Baptist Church for funeral service at 1:30 p.m., Pastor Ross Morrison officiating. Interment in the Baptist Cemetery, Greenmount. As an expression of sympathy, memorials to the Maplewood Manor or to the Alberton Baptist Church would be gratefully appreciated.